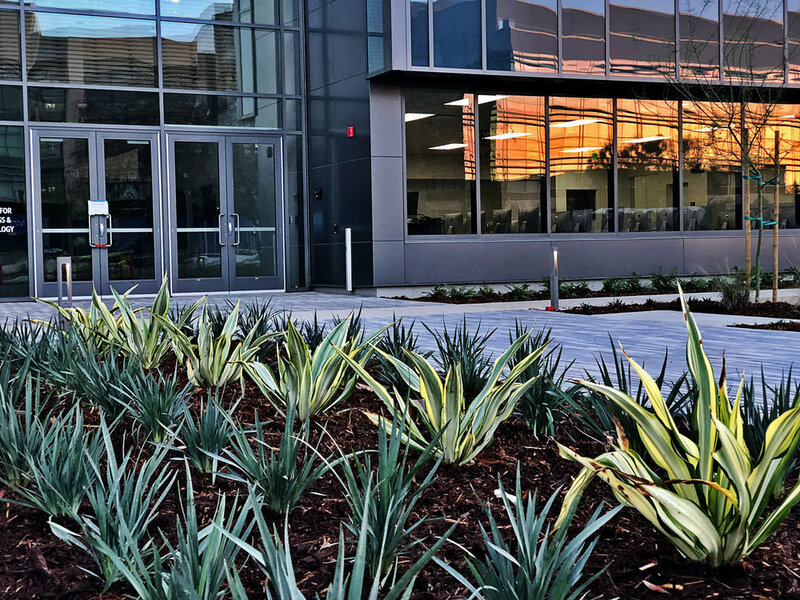 Just before spring, a new project emerged in San Diego’s Sorrento Valley, ready to bloom into a beautiful working environment. In collaboration with LPA, the McCullough team recently completed this beautiful campus for the new tenants, Takeda Pharmaceutical Company. The new office, located in the biotech cluster of UTC, was transformed from an old, tired office park into a fabulous environmental and architectural experience. 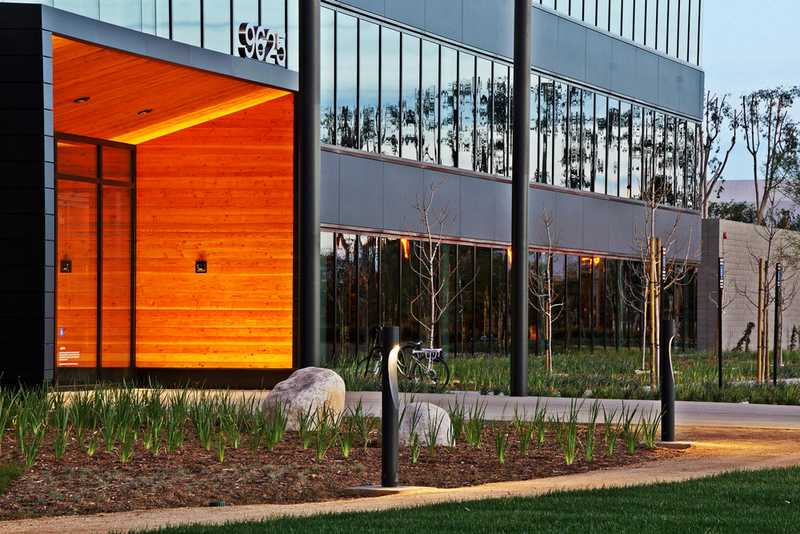 Takeda wanted to have an environment that takes cues from the surrounding areas, maximizes the magnificent views and provides a lot of outdoor space for their employees to meet and be inspired. Working closely with the client, Alexandria Real Estate Equities and architecture firm LPA, McCullough developed a native-plant palette that will grow into a lush and vibrant landscape. We created many pockets that serve as gathering spaces or “outdoor conference rooms.” Positioned along a trail that winds around a lush planted basin, they offer incredible views of the area. A large field is situated along the main entry walkway for employees to play sports, exercise or hold outdoor events. This reflects the company’s value of providing facilities for employees’ physical health and well-being. Our environmental planning focused on the intelligent management of stormwater to increase sustainability throughout the property. An explosion of chaos and color draws people through the landscape, inviting them to linger and coalesce with nature. The experience creates a sense of harmonious balance—a true example of grit, soul and style. 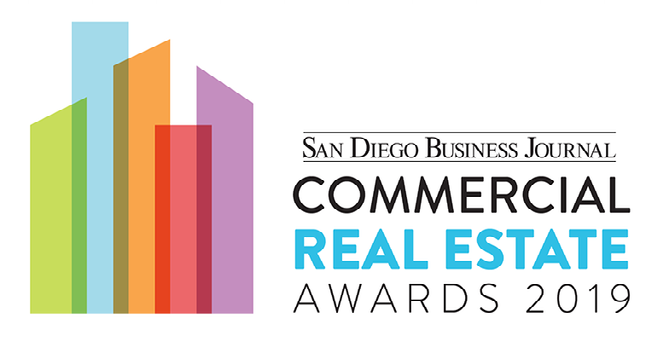 The San Diego Business Journal will be holding its 2019 Commercial Real Estate Awards ceremony the evening of April 18th at Bali Hai Restaurant in San Diego. Each year, this ceremony showcases the most notable commercial real estate projects and deals throughout the region. As sponsors, we look forward to commemorating all of the outstanding developers, architects, general contractors and brokers who have been nominated as we reflect on the past year of success! 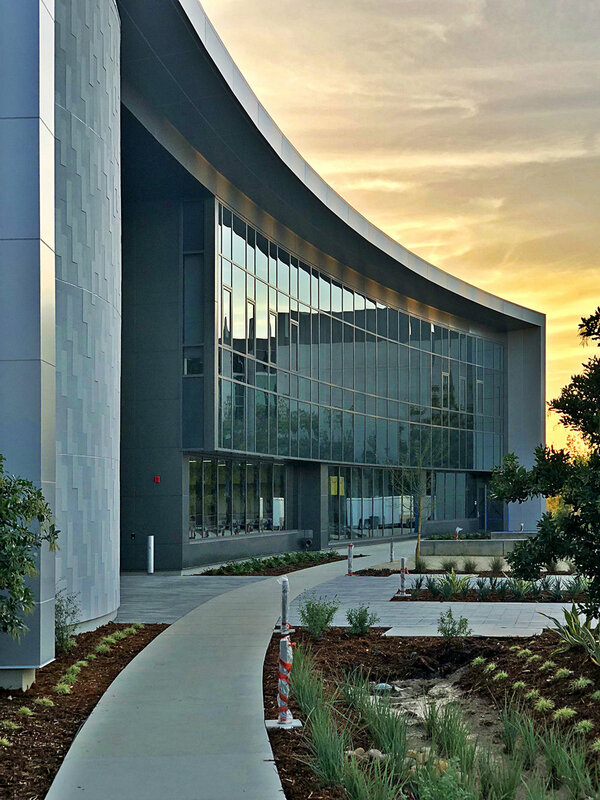 McCullough just finished the landscape design for Mesa College’s Center for Business and Technology, fondly known of as “CBT”. The project called for us to design for three areas. These areas are the Exercise Science building, the Bookstore / Culinary Arts / Campus Commons areas, and finally the Center for Business and Technology. The three facilities create the gateway to the center of the campus. 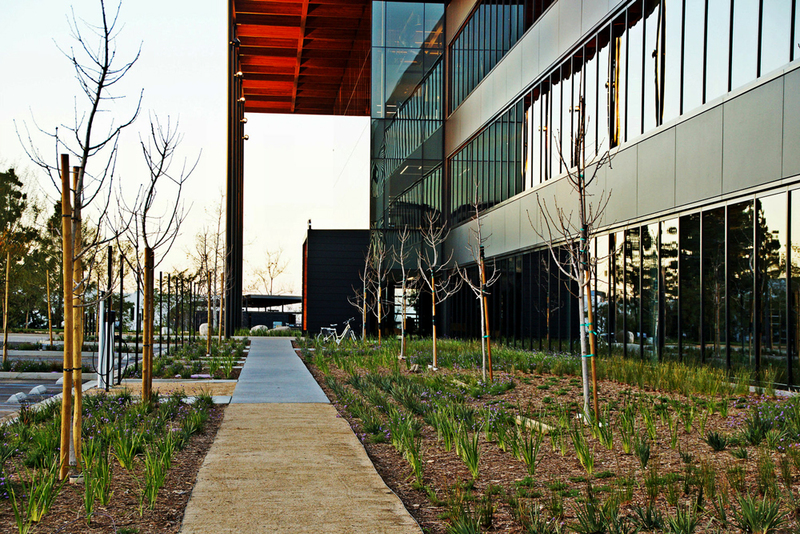 The Center for Business Technology, designed by renowned international architecture firm Gensler, was designed to intimately connect the outdoors with the interior. The architecture beautifully connects the learning environment to the exterior spaces. Their design gave the team a unique opportunity to choose complementary materials that could be used in the interior and exteriors spaces. We worked closely with the design/build team at Gensler and the general contractor early in the process to select those materials to create a seamless environment. The building was designed to form two branches, the middle of the branch opening to an exterior courtyard as an open-air classroom and gathering space. Large flat slabs of stone were arranged to be used for group seating. Electrical outlets and Wi-Fi were installed to provide people the ability to utilize the space in creative ways. Along the front of the building are large transparent windows to showcase the educational environment. Often, the Fashion Department puts their work on display to be viewed through the windows. We included in our design a walkway that connects the garden spaces and acts as a catwalk for student fashion shows. This was a lengthy project and three different architecture firms were involved. 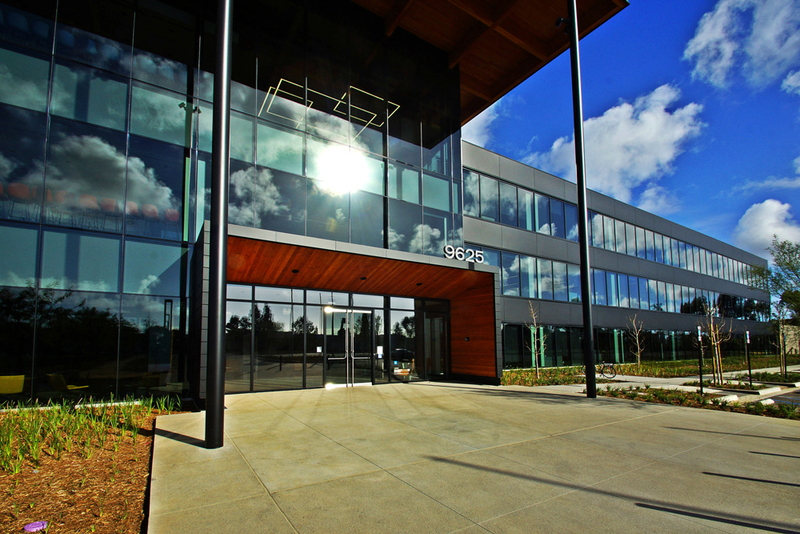 We worked with architects gkkworks [now Cannon Design], Miller Hull with SGPA and for the last phase Gensler. The original master plan was designed by local architecture firm Delawie. Projects like these have unique challenges. The varying styles of architecture demand different styles of landscape design to create that unique user experience. We applied complimentary site materials and furnishings and used unique plant material with varying colors and textures. This gives subliminal cues to people that they are entering a different space for a different purpose. The three facilities now function together as a more complete campus-like experience. David will be one of three keynote speakers for the Bisnow Bay Area Architecture & Design Lunch & Learn on March 20th. Join us for a fantastic opportunity to learn about innovative design trends, the impact of rising costs to the architectural process, and design solutions that address issues for city leaders. During this half-day event, David will discuss how landscape architecture plays a vital role in the built environment and public spaces. Don’t miss it! At the next SMPS San Diego luncheon on April 10th, you’ll get an insider’s view on the tremendous rebirth in San Diego County’s neighborhoods. David McCullough will moderate a group of panelists, who are pioneers of development in our region, followed by a discussion on this “vibrant renaissance.” Did you know San Diego is now a world-class city ranking 30th out of 125 best places to live in the U.S.? We look forward to seeing you there! Light is not often the first thing that one thinks of when considering the built environment, but in fact, as to the photographer, light is a primary ingredient to the success of any site design. In contrast to other professions that utilize light, the impact of light on the built environment is constantly in flux. In its complexity there are three types of light: continuous, absorptive and emissive. In the science of the light spectrum, the fact is that light behaves like a wave and is defined by its wavelength frequency. Simply put, light of different wavelengths is perceived as different colors. Light is perceived in color with an infinite spectrum. Light is absorptive and/or reflective. Light deeply affects human behavior and emotion. There are many other factors as landscape architects that we consider regarding light, yet it’s fascinating to discover how the infinite spectrum of various colors and color combinations affect people emotionally. Human perception is almost always variable and often this subject gets too generalized with poor execution of the lighting use. For example, warm light can make an intimate space feel comfortable. However, in another situation, it may make someone feel unsafe. We know that feelings of safety can be perceived much better with a whiter light rather than a warmer light. The important considerations for designers are to understand what message is most appropriate for the space’s intended use. Another example is the way blue and green light can help the user perceive cool temperatures while yellow, red and orange can evoke the emotion of warmth. This is a simple but powerful concept when designing spaces to interact with varying color combinations. Some spaces work best with complimentary light color combinations (spaces intended for solitude), while other spaces require contrasting color combinations (spaces intended to be active or energetic). Perhaps most important is to understand how much light deeply impacts the human emotions. Sometimes the magic of a space is simply in the play of light. Imagine the way a vacation resort transforms from one experience to a completely different experience at night as the light changes. Or the way Las Vegas, in a very different way, transforms at night and sends a completely different message. Light is either absorptive or reflective. This is a critical component when selecting plants and hardscaping materials. Absorptive light needs to be considered where light concentration is intense. For example, when one walks out of a poorly lit space and into direct sunlight, the transition is blinding. In this case, absorptive materials should be used to help the eye adjust to the vast difference in the light. A solution would be to use absorptive material such as the leaves on a tree or a darker paving surface. In contrast, space along the north side of a building may be perceived as dark and cold, therefore, the reflective light could be maximized with reflective, light materials along with using warm reflective light to warm and brighten the space. Light is constantly changing, throughout the day and night, seasonally and over decades. An idea to consider is that in the winter months when it is cold we shouldn’t forget the summer will come, and it will turn warm or even become hot. One simple way we can plan for this is by selecting the proper trees and plants. Trees that provide appropriate sun in the winter and delicate shade in the summer, such as deciduous trees, would be pragmatic. Likewise, the right placement of these materials will maximize the benefits that light provides for people occupying the space. For example, does the shade cast by trees fall where it is most beneficial at the warmest point in the afternoon. One of our techniques we like to incorporate in designing spaces is to play with shadow and light movement. The way light casts moving shadows by the wind fluttering through leaves and branches of a tree, or the way light reflects and moves through water or the flicker of the light of a flame from a fire feature can create drama. Also, when using artificial light, dynamic as well as static, we know it impacts the human psyche in different ways. These four simple concepts, when best understood, helps the designer work towards a better built environment that is appropriate in its context, understanding of the end user and felt deeply by those that experience the space. Local to the Bay Area? Please join us for the 2019 Bay Area Architecture & Design Lunch & Learn, hosted by Bisnow at Hotel Nikko San Francisco March 20th. You will hear from a world-class group of thought leaders who will discuss innovative design trends, how rising costs are affecting the architectural process, and design solutions for current issues facing leaders within our cities. David will be participating as a panel member discussing Exterior Evolutions. The McCullough team has a New Year’s tradition of reflecting on all that we have accomplished this past year and the design projects that stand out as favorites. Here is McCullough’s Best of 2018 from our talented team of landscape designers. Enjoy! Beach Terrace Inn is one of the few beachfront properties at the end of Carlsbad Village Drive. Built in 1960 at the edge of city’s village downtown, the property has had several renovations and expansions. What started as a number of seismic upgrades, the family-run business decided that minor site upgrades were long overdue. What happened to the original project scope was incredible! We illustrated 3D renderings and showed some internal cost benefits that convinced the owners to make the additional upgrades that, in effect, brought more value to the property. The hotel sits at the top of the bluffs in Carlsbad and terraces down to the beach with a difference in elevation of over 50 feet. The top units have incredible Pacific Ocean views and the lower units open to a private beach. Looking up at the hotel from the beach below, the property resembles a European coastal cliffside village. The elevation differences and the proximity of this property to the ocean is what made it interesting to our team. We started thinking beyond the possibilities of site improvements and explored building renovations that would transform room views. Two buildings stack up the buff at one point with the upper building positioned directly behind the front building. The front building was originally constructed with a faux, non-structural Mansard roof that partially obstructed the views from the rear of the building. We recommended removal of the faux roof, and upon further research it was discovered that the original design had anticipated a future activated rooftop deck. This, along with amenities and plant material, soon became part of the design concept. The roof re-construction, now part of phase three for the property, was one of several improvements that were proposed. During the hotel’s slow season in the Fall of 2018, the hotel completed construction of phases one and two. This included general site upgrades, building and structural enhancements, pool and spa deck renovation, a new green roof on a portion of one of the buildings, access improvements and general landscape upgrades. The challenges for a property like the Beach Terrace Inn are substantial, as is often the case with remodel projects on sensitive sites. But the opportunities, the relationship built with the client, and the consideration that the involvement on a property will benefit the Carlsbad downtown community as a whole, made this project one of our top choices for 2018. The Zizhu Purple Bay, led by Gafcon has to be my favorite project for 2018. This is an 800 acre-mixed use community in Shanghai, which we proposed as an intricate open-space system that compliments the urban fabric and supports the existing ecology. The design embraces the natural waterfront at the edge of the property. The design consists of a man-made canal that cuts through the site introducing programmatic elements such as a retail center, waterfront park and a nature walk leading to the water. The open space tells a strong ecological story extending from the water’s edge and out into the city. This creates a regionally appropriate plant palette and deploys best-management practices that improve the water quality throughout the city limits. The project at 9880 Campus Point Drive has been an incredibly collaborative project with the design teams of DGA and BWE, along with our client, Alexandria Real Estate Equities. For this office building, our primary consideration was focused on the naturalized, human, work-environment experience. We paid special attention to creating scenes and organizing various elements in the landscape for a picturesque project full of spectacular views of the canyon and the on-site wilderness. The 8th & B project is my favorite for 2018. It is located in National City and is a high-energy, mixed-use development project. Consulting with Miller Hull Partnership has been a great collaboration with their team. Together, we brought new life to a property that will stand as a showplace for the city as it strives to revitalize the area. The project consists of a variety of housing units, commercial spaces, public gathering spaces and offsite improvements slated to be a downtown hub. This is a project to keep your eye on, as it becomes a “go to” place for the community. Another year brought in several new opportunities to learn from the projects and experiences throughout the design and build process. One of my favorites was getting to re-design, along with PGAL Architects, the last remaining family-owned Oscars adjacent to the attractive Duck Pond park in Temecula. It was fun for me because Pat & Oscar’s was an iconic (and delicious) San Diego Restaurant. The family, while retaining some of the signature items, like breadsticks, is completely upgrading the restaurant, including the addition of a brewery. The building features a lot of vines growing up trellises and walls, while the parking lot and entryway was also given a facelift for a native and more water-wise landscape. Our choices are sure to impress environmentally conscientious clientele. It’s also important to note, while staying aligned with our philosophy to always try to preserve existing trees, we were lucky enough to work with a client who wanted to retain most, if not all, trees on site which we were 95% able to accomplish. This was a collaborative project with LPA that transformed an old office park site into a new landscape and architectural experience. 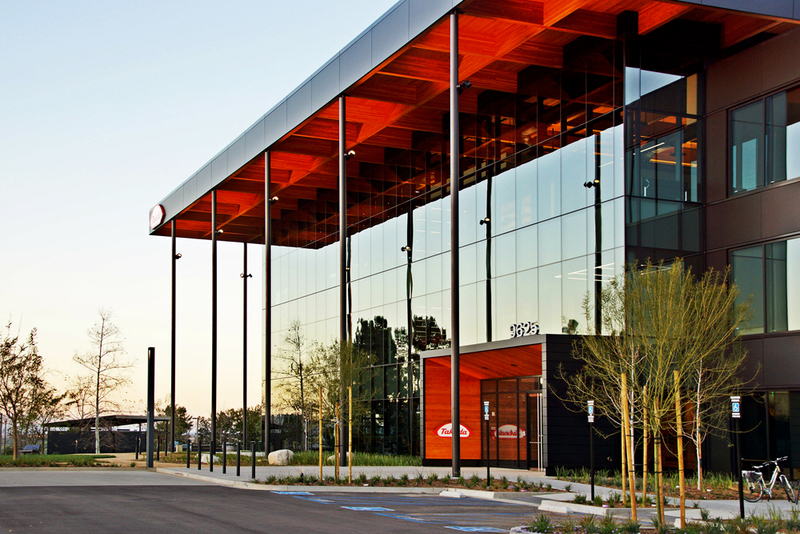 Takeda, a pharmaceutical company, wanted to create an environment that took cues from its surrounding context and magnificent views in Sorrento Valley, and to provide ample outdoor space for their employees. We worked closely with the client Alexandria Real Estate Equities and LPA to develop a native plant palette that would grow into a lush vibrant landscape. Multiple pockets for gathering and outdoor conference rooms were designed along a trail that winds around a planted lush basin, offering incredible views and to serve the purpose of treating storm water. Situated along the main entry walk is a large field that will be used for sports and other gatherings. This feature supports the company’s value of providing opportunities for employees’ physical health and well-being. An explosion of chaos and color draws people through the landscape. This project creates harmony and balance and bleeds the lines between disciplines — a true example of grit, soul and style. We are grateful to our clients, colleagues, family and friends who have been integral to our great success in 2018. We look forward to the budding opportunities that 2019 holds for the McCullough team! Collaboration plays a central role in the built environment, and the beautiful outcome for this project was just recognized with a 2018 AIA San Diego Merit Design Award. Alexandria, a developer Building the Future of Life Science,™ with their tenant Vertex, a Boston-based biotech company and LPA, an award-winning architecture firm, along with McCullough came together to create the vision set by established Vertex. The company wanted to create a sophisticated and attractive work environment to recruit and retain the most talented research scientists in the world. The goal was to allow employees and visitors a place to gather, connect and enjoy the natural beauty of the Torrey Pines habitat. Pictured above is an example of natural taphoni (top right) and the landscape of the project, which resembles those natural geological features. During early meetings with the clients, we discussed how best to connect people with nature—an ideal that is infused into our company’s vision. Drawing from our knowledge of the historic Torrey Pines area, a geological feature within the reserve, known as taphoni, gave us an abstract inspiration to design a landscape that resembles these naturally forming cavities. The McCullough team developed a theme around these unique formations, which is visible throughout the site. For those occupying the building, the juxtapostion between the taphoni forms and Vertex’s vision complete a story that opens the door for conversation and discovery around the science developing at the company. A main focus for our designers was to connect the exterior with the interior spaces. 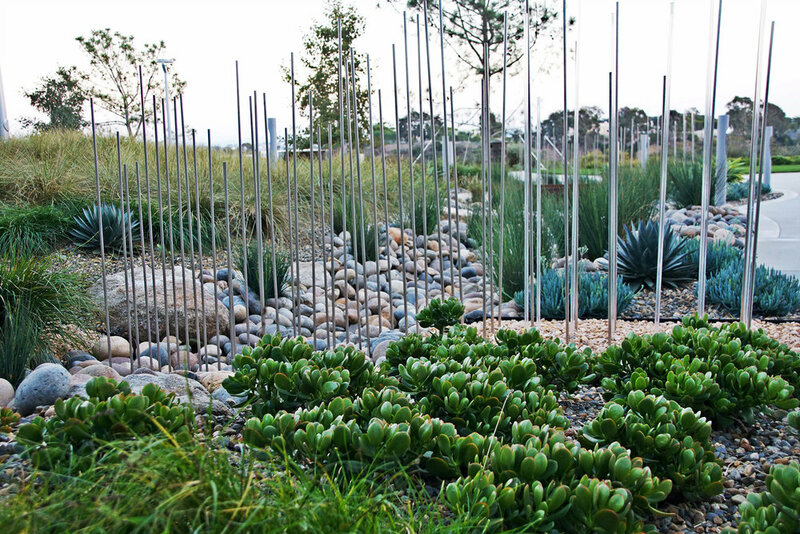 In addition to utilizing natural elements as inspiration, careful selection of plant material was considered to recreate the Torrey Pines habitat in a way that felt safe, comfortable and provides a sense of calm and relaxation. Large spaces were designed for company-wide events, medium-sized spaces for smaller groups and many small intimate spaces for guests to sit, dream, read or contemplate their day. The larger space was a natural amphitheater designed with a place to set up a stage with infrastructure provided for audio-visual and tech connectivity. The medium-sized, smaller group gathering spaces feature BBQs, outdoor conference facilities and fire pits. The smaller intimate spaces contain comfortable seating, concealed under shady trees and surrounded by plants that move in the wind softly or attract hummingbirds and butterflies. Client: Alexandria Real Estate Equities, Inc.
Who’s Building San Diego? McCullough, That’s Who! OCS Lighting + Control, a manufacturer’s reputation firm, sponsored the Gingerbread House Contest 2018. Winners who earn the most “likes” receive “bragging rights” along with a gift basket of Baileys Irish Cream and hot chocolate to warm up those chilly San Diego nights. Our staff came together to revisit their childhoods and build this yummy house. Hours and hours were spent on the landscape design. It’s not as easy as you think to design with gum drops and candy canes. The origin of the traditional gingerbread house dates back to16th century Germany when the decorated cookie-walled houses became part of the Christmas tradition. The Brothers Grimm story of “Hansel and Gretel,” which includes a house made entirely of treats, made the tradition all the more popular.